When people go to see a movie in a movie theater, the last thing they expect is to be a part of a shooting massacre. That’s exactly what happened in Aurora, Colorado in 2012 when approximately 400 movie enthusiasts went to see the premiere of the Batman film, The Dark Knight Rises. 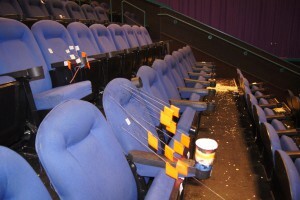 During the midnight showing, a heavily armed and gas mask-clad gunman entered the movie theater, set off tear gas grenades, and shot into the audience. He killed 12 and wounded 70 during the shooting rampage. The gunman was sentenced to life in prison without parole and was convicted of 24 counts of first-degree murder – two for each of the slain victims. After the gunman’s conviction, the victims and their families filed a civil suit against Cinemark USA Inc., the movie theater where the shooting occurred, claiming Cinemark and the property owners should be held liable for lapses in security which contributed to the tragedy. According to plaintiffs’ attorney, Cinemark failed to have armed security, roving guards around the building, and silent door alarms on the auditorium exit. The jury ruled that Cinemark was not liable for the mass shooting because it was completely unpredictable, unforeseeable, and unpreventable. The lawsuit brings up an interesting question. When can a property owner be held liable for a personal injury sustained on their property? When you enter someone’s property, you have a reasonable expectation of not getting injured. This means the property owner is responsible for maintaining a safe environment. Whether the property owner is subject to liability depends on the state in which the injury occurred. An invitee is someone who either has express or implied consent of the owner to enter the premises, such as a customer to a store. They can also include friends, relatives, and neighbors. Because the visitor is “invited” onto the property, it is implied that the owner has taken reasonable steps to assure the safety of the premises. A licensee has the either express or implied consent of the owner to enter the property, but is coming onto the property for his or her own purposes. Licensees are usually salesmen or mail carriers. The landowner owes a licensee a lesser duty only to warn the licensee of dangerous conditions that create an unreasonable risk of harm if the landowner knew about the condition or the licensee is not likely to discover it. A trespasser is someone who is not given permission to be on the property. Landowners typically do not owe a duty to trespassers unless the trespasser is a child. Premises liability is a typical cause of action in personal injury cases where the injury was caused by an unsafe or defective condition on someone else’s property. Premises liability cases are based on the theory of negligence. To win a premises liability case, the injured person must prove that the property owner was negligent in some way with respect to his or her ownership and maintenance of the property. In that regard, the injured party must show the property owner knew or should reasonably have known that the premises were in an unsafe condition and, despite this knowledge, failed to take proper steps to remedy the unsafe condition. In this case, the jury ruled that it was not reasonably foreseeable that a crazed gunman would open fire on opening day of the movie Batman. If the plaintiffs could demonstrate it is common practice of movie theaters in Aurora to have extra security for movies that involve extreme violence, they may have prevailed in this lawsuit. Without such a common practice, the movie theater could not be found liable. The ruling is certainly a blow to the victims and their families who are trying to move forward from the tragedy, but it also goes to show that some random acts of violence are only the fault of the perpetrator. « Are Military Divorces Unfair Compared to Non-Military Divorces?